Okay, it’s always so hard (or used to be for me, at least) to bake a sweet potato perfectly. This may not be news to you all, but I’m sharing it anyway. This was my realization on the “perfect” way to bake and top a sweet potato. 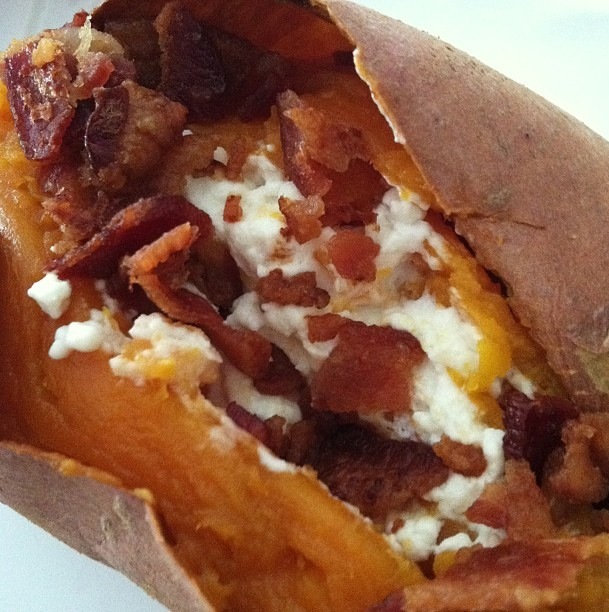 Create a little foil “nest” for medium sized sweet potato to sit in while on cooking sheet. Wash and dry outside of potato and place onto foil. Bake for 45-50 minutes or until soft to touch. Fill the slice with goat cheese and leftover bacon chopped up. That sounds perfect. Sweet potato and salty goat cheese? YUM! Count me in! !